​Manchester City took advantage of Arsenal not playing in the FA Women's Super League this weekend to move level on points with the Gunners at the top of the table after recording a fourth consecutive win when they faced Birmingham on Sunday. With Arsenal not scheduled for a game as the odd team in the 11-club league, City were able to consolidate last weekend's significant victory of the early leaders Gunners and join them on 27 points. Only goal difference now keeps Arsenal top in their hunt for a first title since 2012. 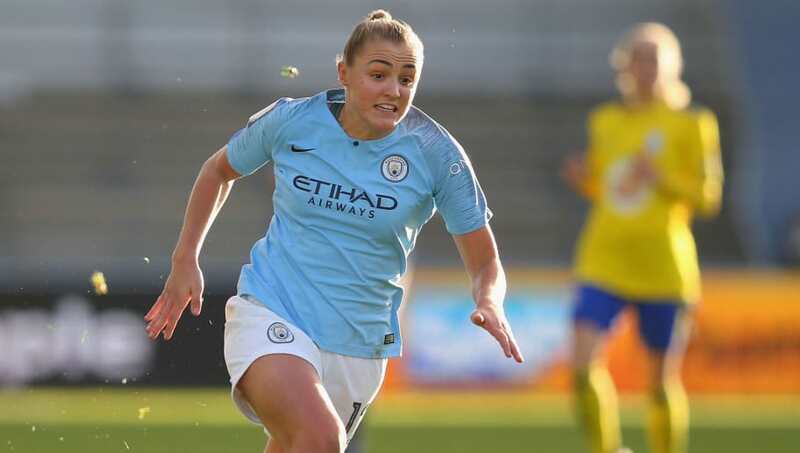 A single 12th minute goal from Georgia Stanway, who scored both City goals against Arsenal a week ago, was enough to see off a strong Birmingham side in Manchester. A win for the visitors would have actually taken the travelling Blues ahead of City and into second place. As it was, 2016 champions City held on to their slender lead, despite giving up more possession and taking fewer shots than their opponent. FULL TIME | Level on points at the top! Yet another win for reigning champions Chelsea saw them jump into third place on goal difference, with a lacklustre start to the season seemingly now fully behind them. Brighton were the team put to the sword as goals from Magda Eriksson, Beth England and Ji So-yun, all scored in the final half hour, handed Chelsea a 4-0 away win. Further down the table, Liverpool were finally able to end their losing streak at five games after holding Reading to a 2-2 draw. In reality, only a late equaliser from veteran Royals midfielder and England legend Fara Williams stopped the Reds from winning 2-1. "It's nice to know that we are doing in training and the belief that we have in ourselves is showing now on the pitch." Elsewhere, West Ham recorded a third straight win after hammering bottom club Yeovil 5-0 on the road. There were braces for Alisha Lehmann and Julia Simic, with Brianna Visalli also netting. Everton's joy after tasting victory for the first time this season in the Merseyside derby last weekend was short lived, with the Toffees going down 2-0 to Bristol City on Sunday. Goals from Ella Rutherford and Katie Road, both scored in the second half, were the difference on the day. The promotion race in the second tier Women's Championship took another surprising turn in the latest round of fixtures as leaders Manchester United lost against Durham, their first league defeat this season. Fellow promotion chasers Tottenham and Charlton also won over the weekend, which means just a single point now separates all four clubs at the top of the table, and only two places in next season's WSL are on offer. The ​draw for the 2019 Women's World Cup was made in Paris over the weekend. Looking to build on a third place finish last time out in 2015, England were placed in Group D alongside British rivals Scotland, who will be competing on this stage for the first time, 2011 champions and 2015 finalists Japan, and Argentina, who are back in the World Cup for the first time since 2007 and have never previously been beyond the group stage.